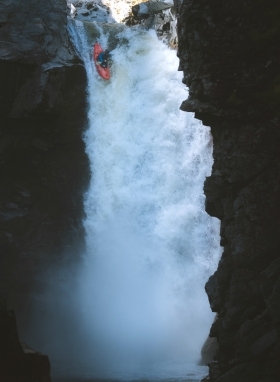 Growing up, I always thought kayaking over waterfalls was such a crazy and unpredictable concept. I didn’t understand the committed process behind the planning and preparation and therefore never appreciated the celebration below a big drop after styling your line. It took several years to identify and learn how to control diﬀerent aspects of freefall in my kayak, but now my understanding of it all has become very detailed. While there is still so much to practice and learn, I hope to share a bit of the knowledge I have gained over these last few years to shed some light on the ‘why’ and ‘how’ of running waterfalls. So many people question why we would want to huck ourselves over a ledge of water in a piece of plastic. I’m under the impression this is mostly due to a lack of understanding of how to break down the basics and understand what really goes on in someone’s mind as they paddle over the edge. 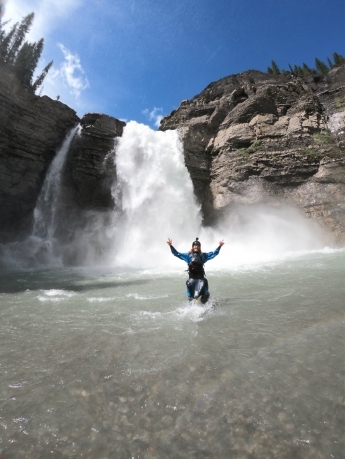 For some of us, waterfalls represent so much more than seeking that adrenaline rush. Waterfalls are beautiful forces of nature but the one thing that may overshadow that beauty is their power. Mamquam Falls is one of my favorite drops. A rather elusive beast, it takes a lot of persistence, and a fair amount of luck, to stand at the lip with the right flow to run it. 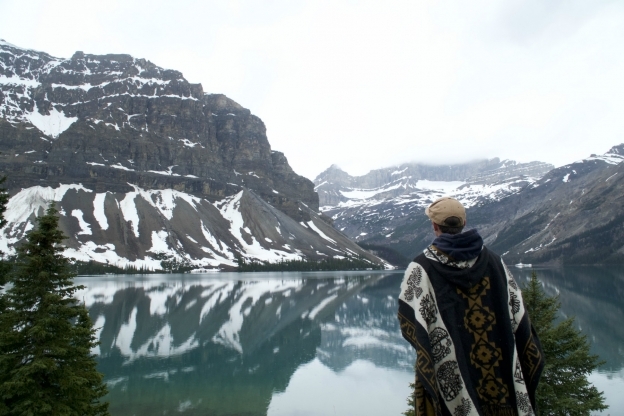 I’ve lived in B.C. for almost four years and in that time, I’ve scouted this drop a hundred times, which has given me a strong sense of respect and understanding for it. When it comes to big drops, I can’t stress enough to take your time. Whether it’s waiting for the next rainstorm to get that exact water level you want, or waiting another season to build up your strength and skills, listening to that gut feeling is very important. Take, for example, my first attempt at Ram Falls. 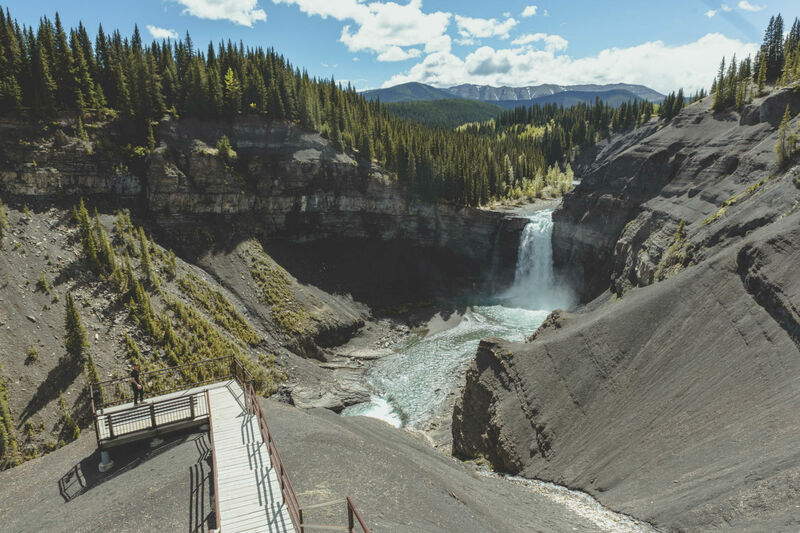 The South Ram River, near the small town of Nordegg, Alberta, stands out to a select group of kayakers because of a beautiful series of waterfalls spread throughout its canyon walls. The tallest waterfall on the river, Ram Falls, cascades nearly 100 feet to a pool below. For years, paddlers have visited the South Ram River to run the Class 5 canyon, but always opt to enjoy the view of Ram safely from the riverbanks. 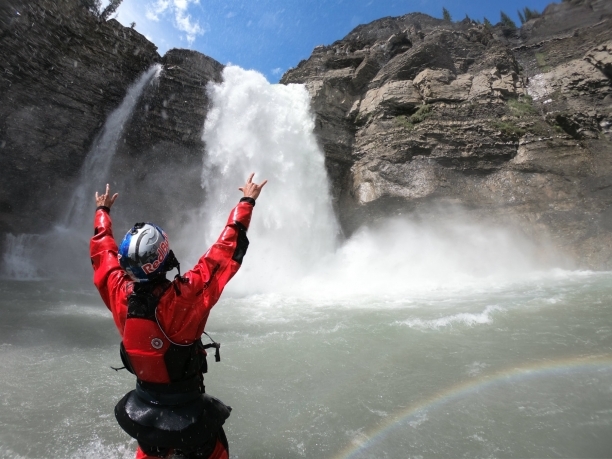 Then in the summer of 2012, after a significant late-season rainstorm, the late Peter Thompson claimed the first descent at the age of 18. 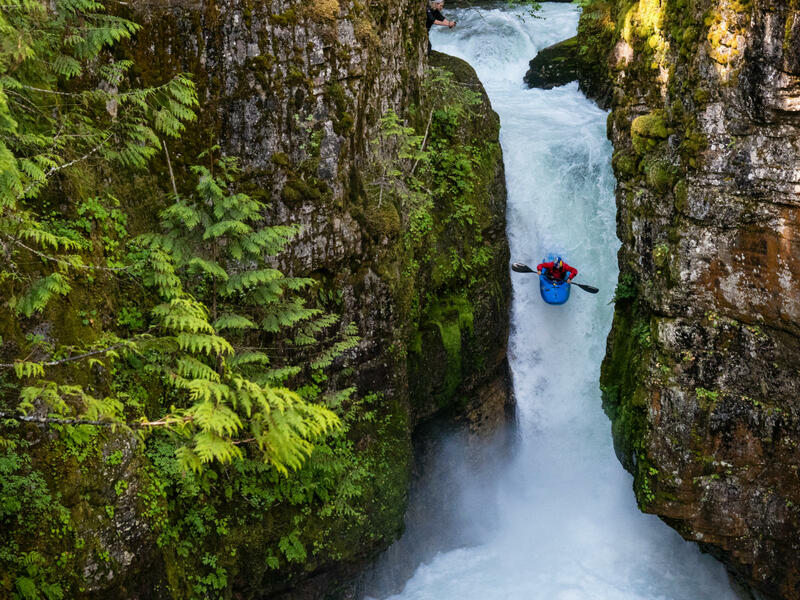 Dylan Thompson and Ryan Lucas, two world-renowned New Zealand kayakers soon followed. 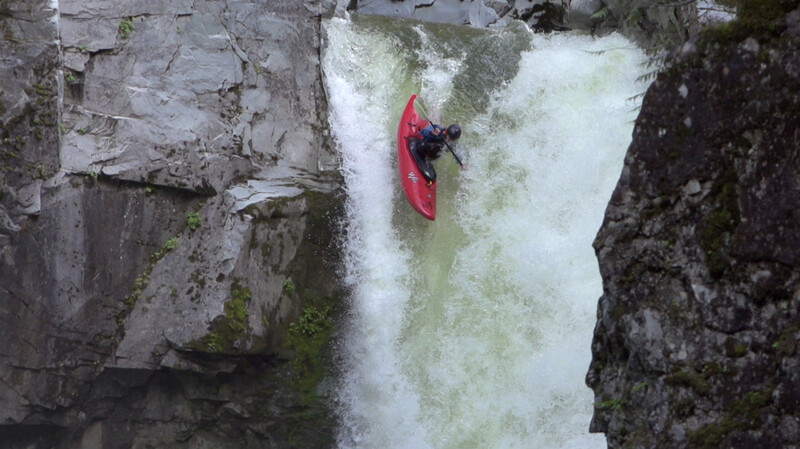 I watched Peter, Dylan and Baby Bird run Ram in Episode 11 of Bombflow TV when I was 14 or 15 years old, and ever since, I considered Ram one of the most incredible waterfalls I had ever laid eyes on. The idea of actually running it began as a distant dream and nothing more. One of those things you think would happen in a perfect world if all of your deepest desires came to fruition. 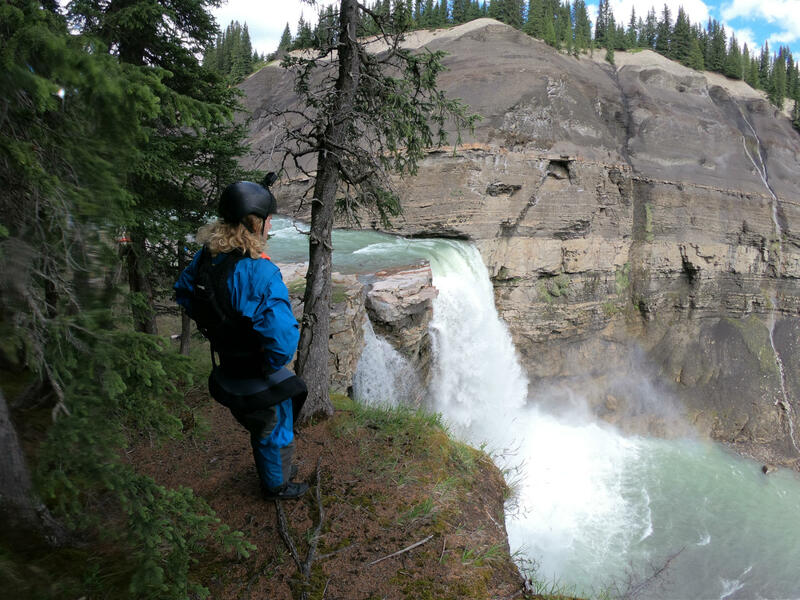 After a few years of devoting a solid amount of time and energy in progressing my kayaking skills, in 2017, I began quietly poking around about Ram Falls. Asking a select few people about the area, I compiled as much information about the falls as I could—Facebook messages full of personal experiences, flow data from decades past, and photo evidence I could find scattered throughout the internet. I kept my intentions pretty quiet. I challenged myself for personal paddler development and planned to only share this experience with my best friends. Plus, who even knew if it would ever happen. 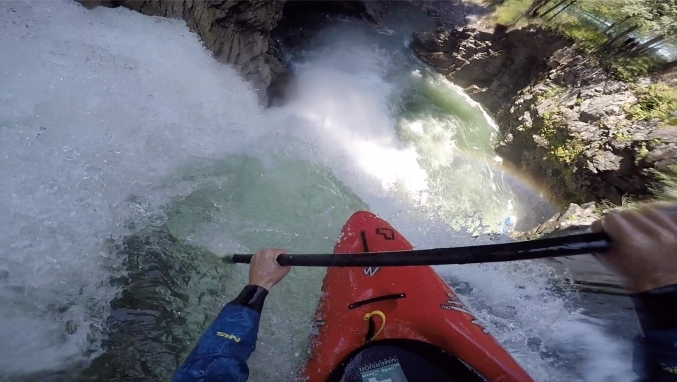 In June of 2018, my buddy from our WCKA days, Knox Hammack, arrived in Squamish ready for a road trip to the Canadian Rockies to search for some solid free-fall action in our kayaks. The drive was as beautiful as it gets, passing through thickly forested valleys created by some of the most spectacular mountain ranges I’ve ever laid eyes on. 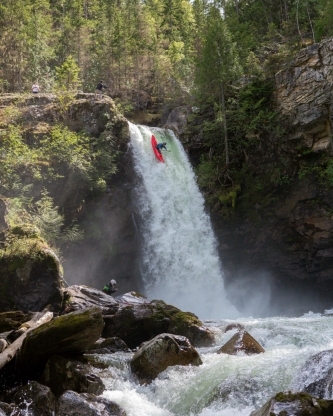 We made a quick stop in Revelstoke, paddling a few laps on the Blanket Creek waterfalls (Sutherland Falls). This was our first time ever paddling in Revy and it offered a perfect taste of what the region has to oﬀer. 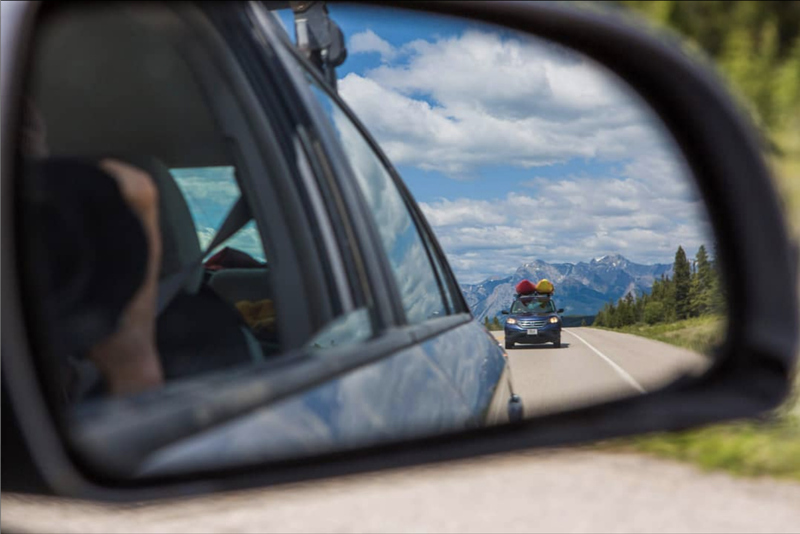 Entering Alberta, we passed through Banﬀ, the epitome of mountain towns, and continued north to Ram Falls Provincial Park. The mountains up the Icefield Parkway are aggressive yet majestic and look as though the earth collided and tore up unfathomably large chunks of the landscape, shooting large slabs of the earth into the sky and creating the jagged peaks we can see from the highway. As we reached the trail to the falls, my heart, heavy with anticipation, thumped against my chest with an intense rhythm. But when we walked to the lookout, we quickly realized the river was way too low to even consider running the falls. When I arrive at a waterfall, the first thing I look at is the water level and determine what that level does to the waterfall and the landing. If the level isn’t right for my comfort zone then it will have to wait another day. It’s as simple as that. On that day in June of 2018, despite the 13+ hours drive from Squamish, running Ram wasn’t going to happen. When contemplating a big line, one that already pushes against your boundaries, there’s no need to push that even further. Knowing and understanding how much is too much or how little is too little, comes down to what we know about the physics of a waterfall. With high water level, you have more water flowing over the lip, creating more aeration and ultimately creating the potential for a softer landing. Bubbles of aerated water resurfacing from the base of the falls create boils. The more water there is, the bigger the boil is or “pile of pillows” you will land on. GoPro POV of dropping Mamquam Falls. However, there isn’t currently a cut and dry way to determine what the impact will be like with every descent. Rivers carry astronomical amounts of force through their paths and when you look at waterfalls on the higher volume side of the spectrum, there seems to be a threshold where the raw power of the water creates an incredibly violent landing zone to deal with, causing potential gear failure, injury, or complications with safety measures because the river is moving with so much more speed and power. With lower volume, everything will be moving more slowly but there’s less water breaking the surface tension of the pool below to cushion your fall. Personally, I believe the importance of sticking your line and minimizing your area of impact grows significantly with lower volume drops. 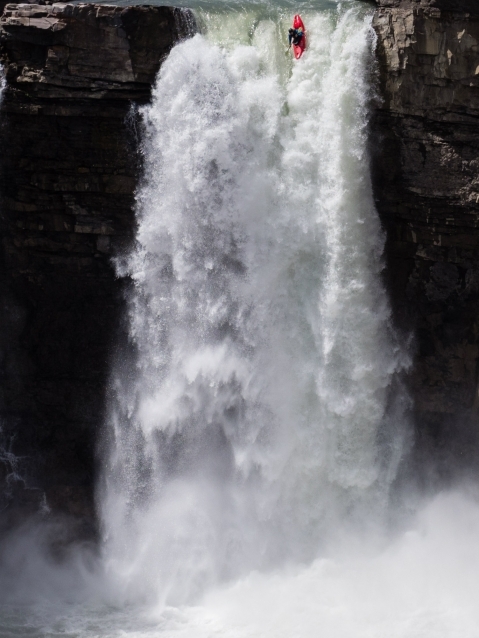 Part of the skill behind running a big waterfall, though, is knowing that you’re putting yourself in a position to take a big hit and preparing for that impact. It’s important to remember that the better your line is set up, the better your landing will typically go. It’s also important to acknowledge the current weather. If you’re in the middle of a storm, the water could still rise. If you’re at the tail end of the rain or snowmelt, the river could drop. Just because the levels look good at the initial scout doesn’t mean it will in two hours when you’re still operating a rescue situation. Plan ahead and give safe time windows to work with. On that first trip to Ram Falls, we had been checking the weather and things were looking very promising up until the first day or two of the drive when the weather started to clear. 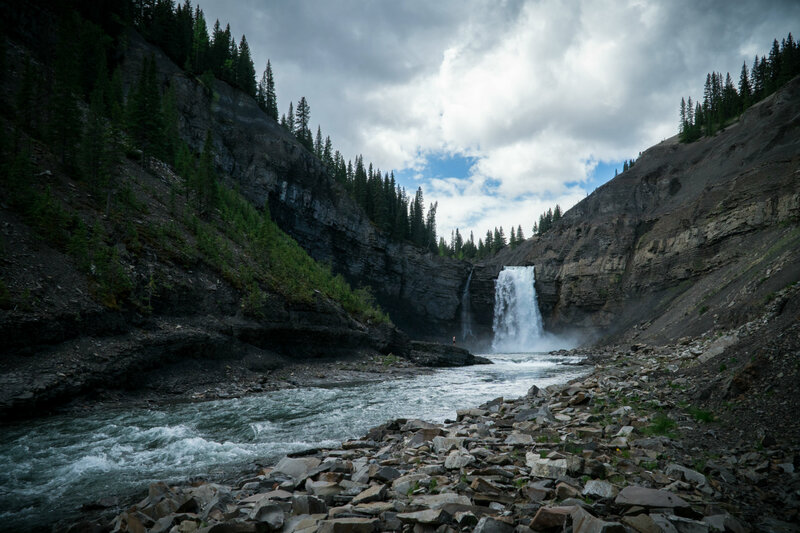 We agreed to continue on with the intentions of at least being able to scout the falls in person and come up with a valid plan of attack for a second attempt in the future. While it was devastating to get shut down, it was also a bit of a relief knowing we had another couple of months—or years—to prepare for the big day. As it turns out, we wouldn’t get those couple of months to prepare. Fast-forward through June and the North Fork Championship. The West Coast season had been all-time leading up to July. Aniol Serrasolses was coming into town from Washington to do some boating. He’s considered by most to be the master at running waterfalls and has logged the most 100+ footer descents out of anyone in the history of the sport. I had been scrolling through Instagram on my phone that week when I noticed a photo of Ram Falls at an insanely epic flow similar to that of the first descent. Despite my assumptions that Ram Falls wouldn’t happen this year, it was game time. I quickly checked the weather and saw that there was still more rain on the way, making it very likely that the level would hold long enough for us to get there. I called Aniol and half-jokingly suggested he should forget about Alexandra being his last 100-footer and come straight to Ram with us because it was the perfect opportunity to hit a perfect waterfall and I really wanted him to be there with us. He agreed. Like before, we made a quick pit-stop to work the muscles on Sutherland Falls, then loaded back up to finish the drive. When I pulled up to the park for the second time, I huge wave of panic hit me. Different from the first feelings of unknowing anxiety, this time the fact that all signs pointed toward us dropping the falls made me nervous. Aniol and I took a few minutes to check the flow in person and work through a few of our concerns. After some heavy contemplation, we both came to the conclusion that it was good to go and we wanted to do it. 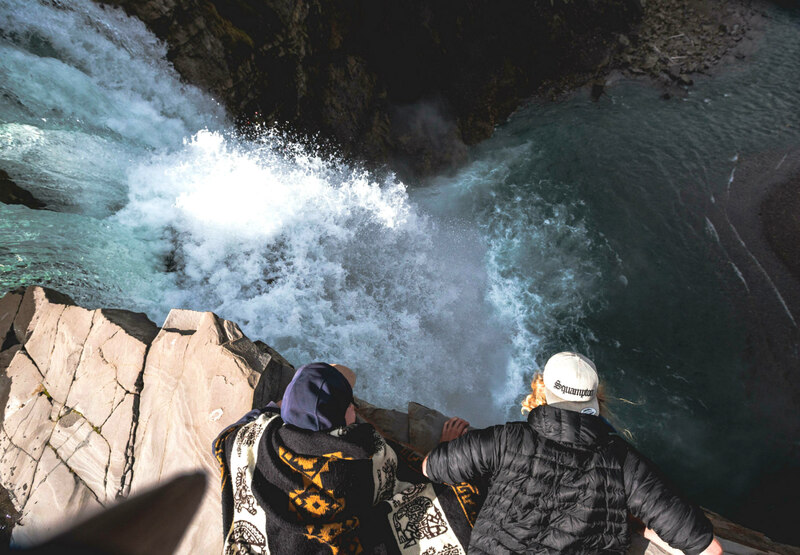 We floated our way down to the falls, eddied out above the lip and walked to the edge for an up-close-and-personal view of the drop. We scouted every inch of that waterfall. We threw logs in the current and observed the way the water reacted. A particular rock, five-feet down the drop, which seemed to be tucked just behind the veil concerned me. Hitting a rock could throw oﬀ our angle severely. A few more test logs assured us that it was just a spray of water and our boats would clear the rock. Aniol asked if I wanted to go first. I hesitated. 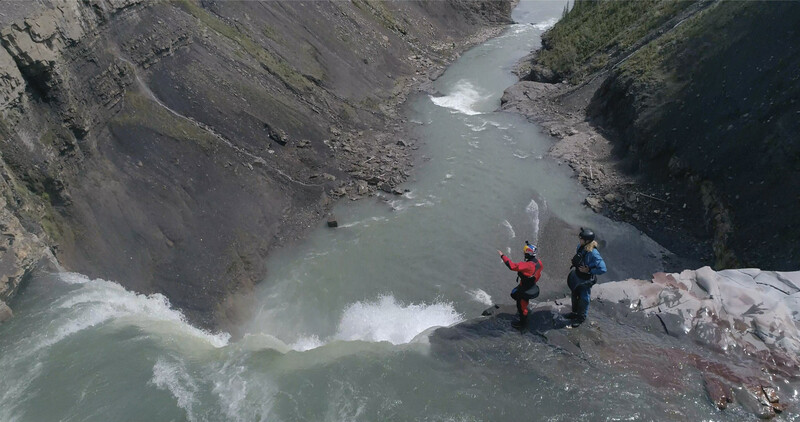 This was the biggest piece of whitewater, with a water level at its absolute lowest flow to safely descend, that I had ever looked at with the intention of running. I think Aniol knew this and oﬀered to go first, skipping that traditional game of Rock, Paper, Scissors and giving me the huge privilege of watching his line. As I watched him float over the slanted lip of the falls, seeing how perfectly his bow dropped into the curtain, I knew instantly I had my line locked down. High on adrenaline, I focused on my line so intently it seemed like everything else disappeared around me. Mentally, I felt as though I became one with the waterfall, feeling every current and feature leading to the perfect line. As I peeled out, I zoned out and calmly paddled to the lip. The moment I came over the lip I knew I was exactly where I wanted to be. With my paddle perfectly placed, I stayed neutral and flowed with the water. 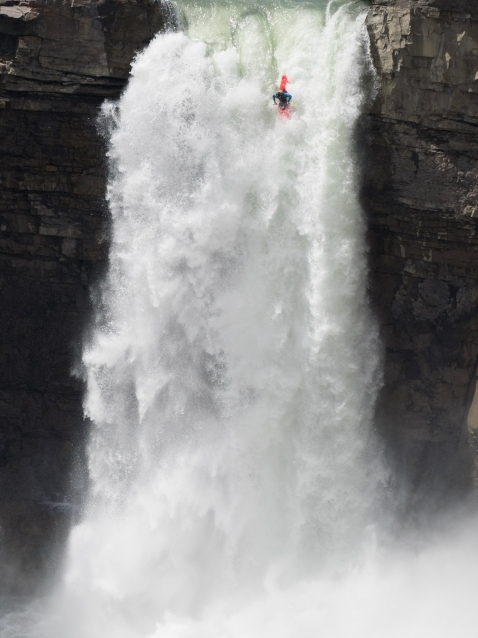 I tossed my paddle about 30 feet into the free fall and tucked my body for the hit. Then I waited. There are millions of ways to run a waterfall and I look at it as an art. Everyone has their own unique style and fluidity that comes from their own interpretations of the flow of water and how to navigate it. It’s about taking what works for you and what you understand and creating your own method to find the path of least resistance. I try to think of everything I do from the lip of the falls to the pool below as one singular movement drawn out from start to finish. It requires a combination of extreme finesse, focus and power that can often be overlooked. I use my paddle to control most of my angle while floating over the lip, trying to find the perfect speed and balance. With my blade in the current, I can make the slightest movement to push or pull and adjust my boat’s angle. On a drop like Mamquam, the lip comes at you at almost a 45-degree angle. This adds even more to the simple push-pull movement and now is adding a less direct arc to the line, which causes me to occasionally drop my edge and carve into it as well. The blade can be used to set the initial angle on entry but it doesn’t stop there. A common thought is that your paddle can only be helpful at the lip where the highest concentration of flow is, however it can be used to make corrections in your line halfway or more down the falls if you misjudged any aspects of the approach and entry. Meaning, you can set yourself up with a bit of a safety net knowing you have some control over your angle by pushing or pulling on the water in the veil during freefall. This can create slight shifts in your momentum and can allow you to slightly alter your trajectory if you make a mistake up top. This is easier with higher volume drops where there is more water to push or pull on your blade. Once I have reached the halfway point, I slowly start leaning in toward the tuck. I like to lock up, make myself as small as possible, and prepare to be blown to the back deck of my kayak. It helps to keep the body position open as I come over the lip of the falls so there’s a line of sight on the landing and I know when to expect to hit the pool below. This ties in heavily with the importance of being neutral and relaxed leading up to the tuck. I have the easiest time setting my line when I am in a calm and neutral body position relative to my boat and feel more focused on and in tune with the flow of the water. When I am all scared and tense, I get jittery and tend to make mistakes in my movements by doing them too aggressively and losing the focus and finesse of my line. I always try to position my body slightly over the cockpit so I feel centered or even a bit forward coming oﬀ the lip, making it easier to find my balance and get over my bow. This minimizes the amount of movement required to tuck so that I don’t make a heavy shift in momentum and throw my angle off. The second I hit the bottom of Ram Falls, I smashed my face hard into the cockpit rim of my kayak, breaking my nose upon impact. But I came out upright and threw my hands in the air. I was at the bottom. Six or seven years of dreaming had led to this exact moment. After a few minutes, the adrenaline started to wear off and I really started to feel my broken nose. We were hours from the nearest hospital. Aniol, always the mentor, had broken his in the past and set it himself, so he coached me through straightening my nose. I grabbed it and followed his instructions until I heard a click, and after two tries he told me it looked straight enough, so I called it good. I didn’t really want to try again. We looked up at the steep scree slope in front of us. I had almost been as scared of hiking my boat out of the canyon as I was paddling oﬀ the falls. It was a sketchy hike and you couldn’t slip, otherwise, you were taking a tumble all the way to the bottom. With the help of our friend and some ropes, we eventually made it to the top. There were a few people around the lookout who had watched us paddle over the falls and they stared at us as though they had seen a ghost. We all know the questions going through their head and they’ll probably never fully understand and that’s okay. 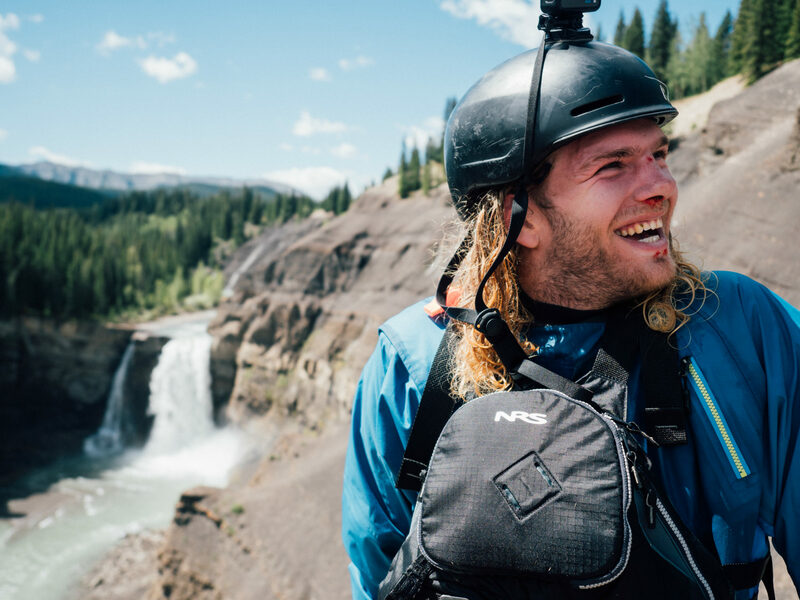 Editor’s Note: Originally from Ontario, guest contributor, Edward Muggridge is a graduate from the World Class Kayak Academy and an NRS Ambassador living and shredding in Squamish, B.C. Watch Edward run Ram in the film Road to 100. Photos: Jeremy Allen and Lachie Carracher unless otherwise noted.